Ready-to-use dNTPs MIX 10 mM Total is a buffered solution of ultrapure deoxynucleoside 5’-triphosphates (2,5 mM dATP, 2,5 mM dCTP, 2,5 mM dGTP, 2,5 mM dTTP), supplied as lithium salts solutions. (much higher stability) Ready-to-use dNTPs MIX guarantees high amplification efficiency and prevents incorrect incorporation of dNTP in the synthesized DNA strand. Ready-to-use dNTPs MIX 10 mM Total is a buffered solution of ultrapure deoxynucleoside 5’-triphosphates (25 mM dATP, 25 mM dCTP, 25 mM dGTP, 25 mM dTTP), supplied as lithium salts solutions. (much higher stability) Ready-to-use dNTPs MIX guarantees high amplification efficiency and prevents incorrect incorporation of dNTP in the synthesized DNA strand. Ready-to-use dNTPs MIX 8 mM Total is a buffered solution of ultrapure deoxynucleoside 5’-triphosphates (2 mM dATP, 2 mM dCTP, 2 mM dGTP, 2 mM dTTP), supplied as lithium salts solutions. (much higher stability) Ready-to-use dNTPs MIX guarantees high amplification efficiency and prevents incorrect incorporation of dNTP in the synthesized DNA strand. dNTPs SET 10 mM is a buffered solution of ultrapure deoxynucleoside 5’-triphosphates 10 mM of each dNTP (separately: dATP, dCTP, dGTP, dTTP), supplied as lithium salts solutions. (much higher stability) Ready-to-use dNTPs MIX guarantees high amplification efficiency and prevents incorrect incorporation of dNTP in the synthesized DNA strand. dNTPs SET 100 mM is a buffered solution of ultrapure deoxynucleoside 5’-triphosphates 100 mM of each dNTP (separately: dATP, dCTP, dGTP, dTTP), supplied as lithium salts solutions. 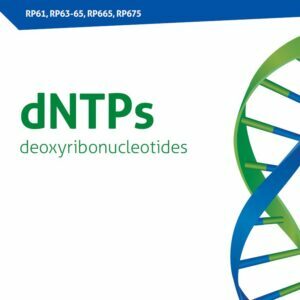 (much higher stability) Ready-to-use dNTPs MIX guarantees high amplification efficiency and prevents incorrect incorporation of dNTP in the synthesized DNA strand.